LOS ANGELES (CBS/AP) Charlie Sheen's recent arrest for allegedly threatening his wife, Brooke Mueller, with a knife probably comes as no surprise to Brittany Ashland. She was dating the Hollywood bad-boy star of "Wall Street" in 1997 when she filed a lawsuit claiming that he beat her up, and then threatened her to keep her quiet. Photo: Brittany Ashland filed suit against Charlie Sheen in 1997 for assault. Ashland filed her lawsuit against Sheen Feb. 6, 1997, claiming that on Dec. 20, 1996, Sheen grabbed her by the hair and slammed her onto the marble floor of his Agoura Hills home, knocking her unconscious and splitting her lip so badly that she required seven stitches. 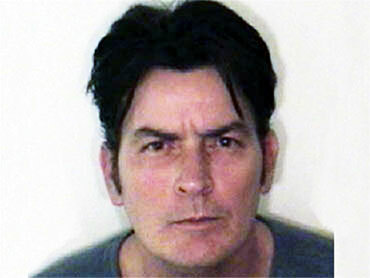 Photo: Charlie Sheen in a mugshot from Friday, Dec. 25, 2009. The suit also claimed that Sheen forced her to strip off and dispose of her bloody clothes, and threatened to kill her if she told anyone about the assault. The suit charged the actor with assault, battery, negligence, false imprisonment and emotional distress and asked for unspecified damages. Police investigated the claim and prosecutors quickly filed criminal charges against the actor on Feb. 20, 1997 for misdemeanor battery with serious injury. 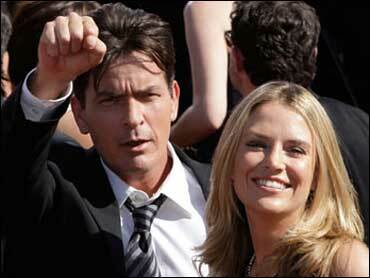 Photo: Charlie Sheen and Brooke Mueller arrive at the 59th Primetime Emmy Awards Sunday, Sept. 16, 2007. Sheen's spokesman at the time, Jeff Ballard, called the suit "a cheesy attempt at extortion" saying "it's the typical price you pay for being a celebrity in today's age." Sheen initially pleaded not guilty to the charges but on June 7, 1997 he entered a plea of no-contest to the criminal charges and was sentenced to a one-year suspended prison term and two years probation. Judge Lawrence Mira also ordered the "Platoon" star to pay $2,800 in fines and restitution, perform community service and attend eight counseling sessions. At his sentencing, Sheen reportedly told the judge "I feel this is very fair, and I'm grateful… you will not see me back in this courtroom," according to The Los Angeles Times. Sheen wasn't able to keep his promise to the judge, however, and violated his parole in 1998 after he was turned in by none other than his father, actor Martin Sheen, for a cocaine overdose. He was ordered to undergo a drug rehabilitation program. Now Charlie Sheen's legal and personal battles have entered a new chapter with the charges stemming from the Christmas Day confrontation with his wife, Brooke Mueller Sheen. Charlie Sheen was arrested Dec. 25 after Brooke Mueller Sheen called 911 during a fight that began when she said she wanted a divorce. She told police the actor pinned her on a bed, put a knife to her throat and threatened to kill her saying "You better be in fear. If you tell anybody, I'll kill you."